The Roman Baths of Bath, England are one of the most interesting historical sites in the UK. The complex consists of four main components – the Temple, Sacred Spring, Bath House, and a museum that contains Roman artefacts found in Bath. Before being given its self-explanatory modern name, the city was known to the Romans as Aquae Sulis in honour of the goddess Sulis Minerva. The site was built around a collection of ancient hot springs that are still revered for their ability to consistently produce more than 1 million litres of hot water per day. You’ll want to start by touring your way around the terrace and then visiting the Great Bath. From there you can move on to see the Sacred Spring, Roman changing rooms and saunas, heated rooms, plunge pools, spa fountain, and temple courtyard. After you’ve seen the entire complex you could then stop at the museum on the way out to view some of the relics and artefacts that were found at the site when it was first re-discovered in the late 1700s. Families will enjoy the activity trails, costumed characters, and audio guides. You also have the option of scheduling a children’s party event. There are two trails – the Roman Baths tour (ideal for families with smaller kids) and the Meet the Romans tour (better for adults or families with older kids). The construction has been added to and redeveloped throughout the centuries, so there’s an immense amount of history and culture to be discovered. In the 12th century an additional bath was built on top of the King’s Spring reservoir. Later, in the 16th century another bath was added to the city – Queen’s Bath – south of the same reservoir, which is now housed within a structure built in the 18th century. Likewise, the upper floor of the south colonnade was added during the second half of the 19th century. These are just some of the maintenance and construction efforts that have been put into the site over the years to make it the grand modern spectacle that it is today. The city of Bath is a beautiful place to explore outside of the Roman Baths, so when you’re done seeing the sacred hot springs, baths, temples, and museum exhibits, you’ll also want to stop by the Bath Tourist Office to get the latest info on tours in the area. The Highlights of Bath City Walk, Around and About Bath, Scarper Tours, and the Bath Abby building are some of the tours and destinations you’ll want to see first. 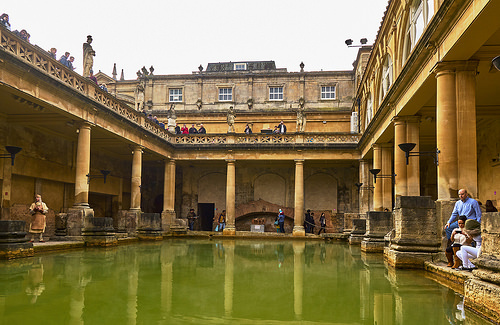 Touring the area and seeing all that the Bath has to offer will surely help you understand why the Romans dedicated the site to a goddess and used it for socialization and healing for hundreds of years. Nowadays, it’s a bustling destination that attracts more than 1 million annual visitors who come from around the world to experience this magical place.